Without good branding and a clear visual identity, there is no successful development of the franchise concept. It’s a fact. Already defined visual identity and recognizable brand. If they want to develop a successful product or service chain that always offers the same experience for customers, franchisees need to follow a specific set of rules, where the business identity takes a central position. We at Zambelli Brand Design already had significant experience with franchisers, as we have created one of Croatians most famous and successful franchise brands: Surf’n’Fries. Still, when a young and vibrant team of entrepreneurs from Kuwait contacted us with their unusual offering, it became clear that an entirely new challenge lies ahead of us. And that is precisely how we like our projects – those that inspire us to take a different approach. 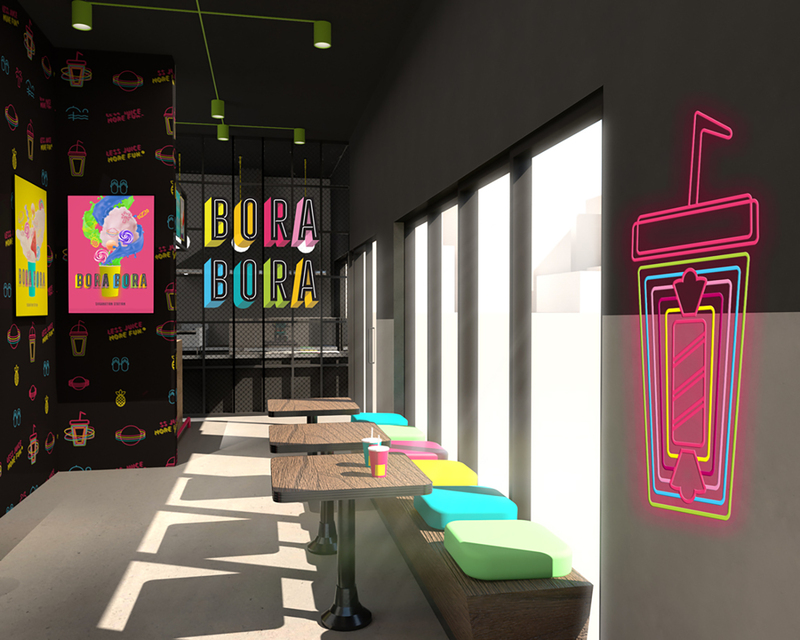 The story of the interesting Bora Bora franchise concept started almost by accident, in a casual chat between creative and energetic people from Kuwait, who recognized an untapped potential in the market. Namely, alongside other cultural specifics, the Middle East has two big traditions: juice bars with freshly prepared fruit juices and a great passion for sweets. 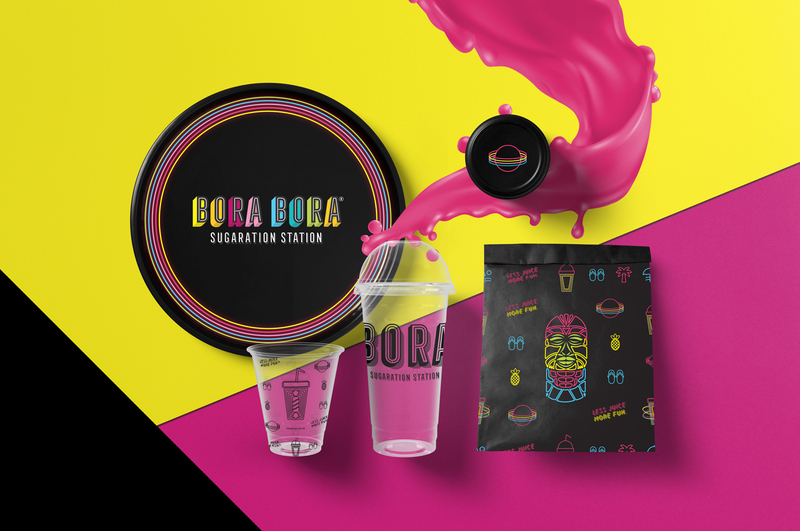 Bora Bora merged the two into a new product and that is how this business idea came to be, offering probably the craziest drinks you have ever seen. Beside juices in all the colours and tastes you can think of, they played with various sugary add-ons, creating imaginative combinations for sweet-tooth people, who also enjoy discovering new experiences: drinks with candy, popsicles, lollies, chocolate, even popcorn! Almost instantly, Bora Bora exploded in the market as a new Instagram attraction, mostly between young people seeking adventurous experiences. 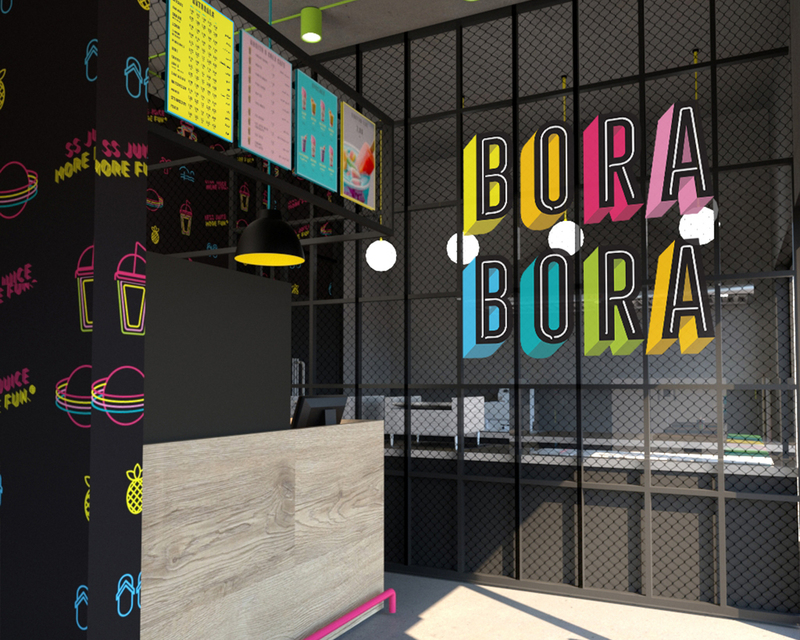 Soon after founders created the first Bora Bora brand identity, they realized that they want to share their passion with the world, so they developed a franchise concept. However, they lacked a consistent and coherent brand strategy, along with that recognizable visual identity that looks the same at every touchpoint and that is so important in the franchise business. 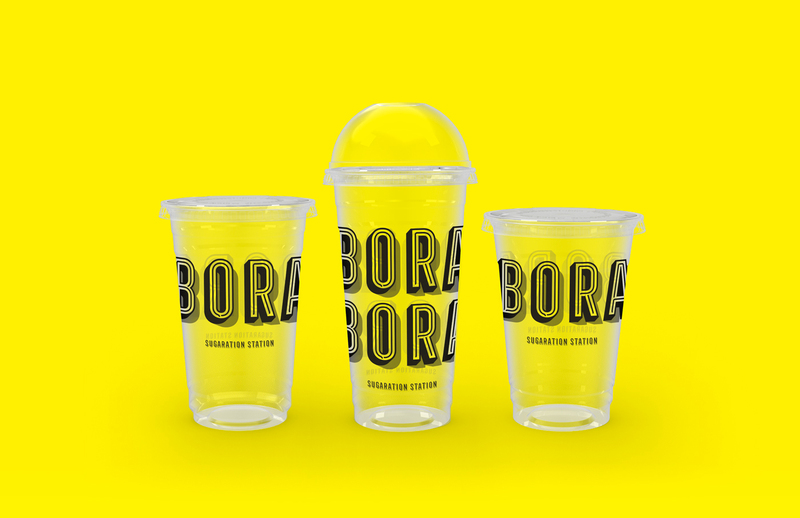 “At Bora Bora, we believe having a strong and reliable visual identity is as important as the products we sell. Zambelli Brand Design guided us to understand our audience, enhance their experience, created our standards, and made our brand ready for expansion. Bora Bora brand craved for a new design and a new life. The new brand needed to illustrate that adventurous spirit sipped from a glass full of joy and colour. However, in our brand strategy process, first, we needed to define an entire platform for all future communication. 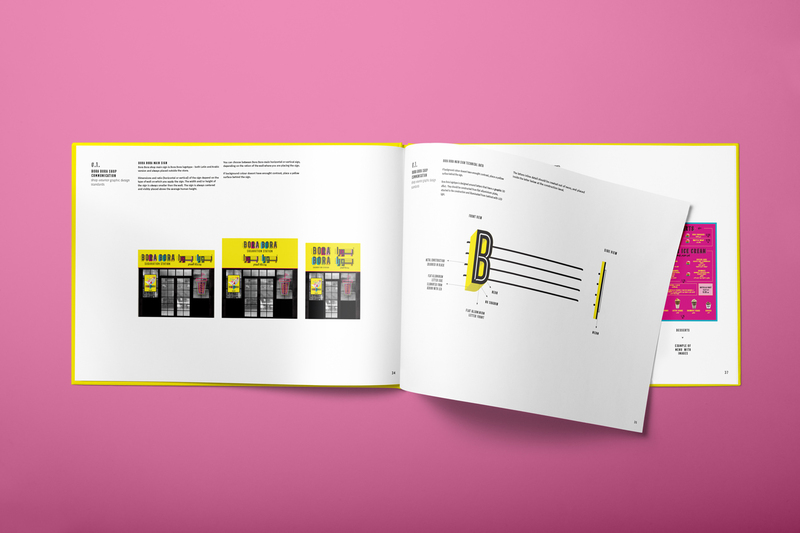 In specific, we had to identify the target audience, brand positioning, and product category, as well as the brand experience and brand personality. We had to deep-dive into the company’s values and meaning. When we started to brainstorm the Bora Bora’s visual identity, we used the target audience as our guide, and those are the young people in Kuwait: from kids that still go to juice bars with their parents to teenagers and students, looking for new experiences. That is why we have chosen bright and vivid colours, as well as the popular retro style, carrying a flair of candy stores, bonbon trailers, and neon lights from the ‘50s. Considering its extremely sugary offering, Bora Bora couldn’t have the same product category as all the other juice bars. It had to be something entirely different that would reflect its unique products, which is why we came up with a new product category – “The sugaration station”. In short, it’s a place where you stop by to recharge with sweet pleasure, adventure, and a bit of that hedonistic energy. The Islamic culture strongly values modesty and the client required from us to create an identity that will reflect both the adventurous spirit and those values that are based on honesty and down-to-Earth personal traits. 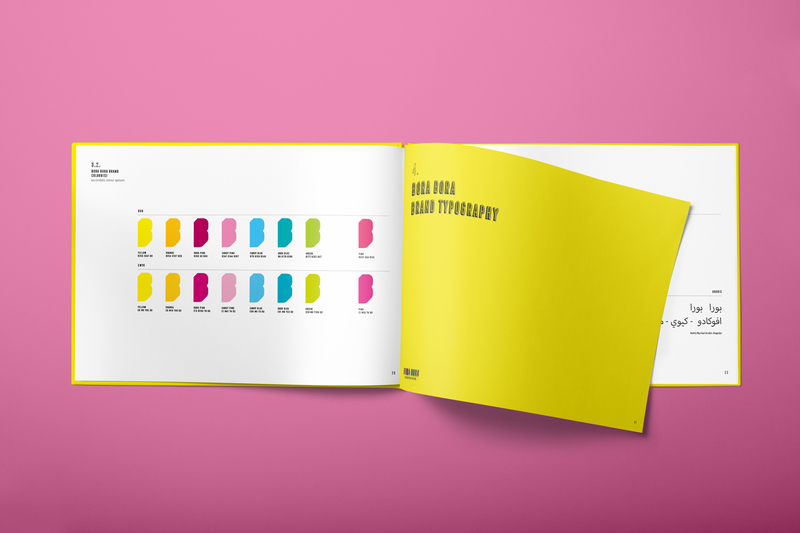 To discover a specific brand personality, we always put together a fun workshop, where we include our clients in a creative process of finding the brand’s essence, presented through different types of human personalities. The Bora Bora team concluded that their core aligns with a “sweet, humble, and adventurous hero”. 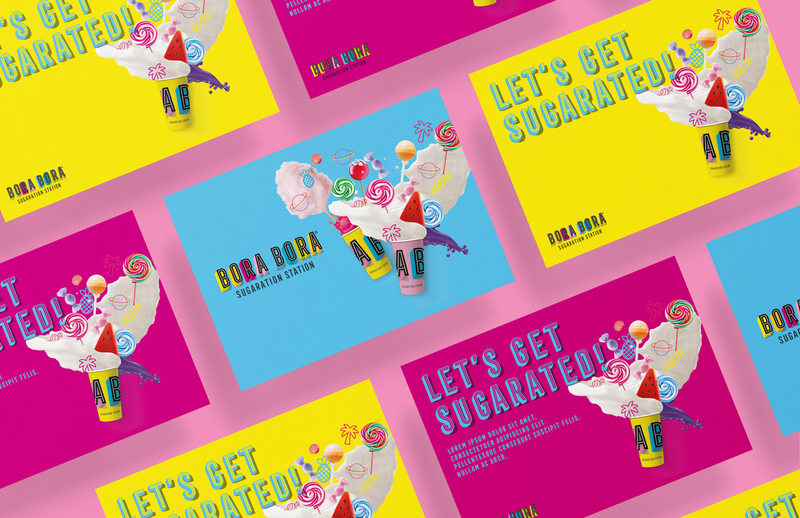 After we have developed the brand strategy, created and implemented a new visual identity – across all communication channels, social media profiles, corporate collaterals, sales brochure, and online ads – Bora Bora started to spread its network of “Sugaration stations” across Kuwait. Also, the franchise development inspired them to enrich their drinks offering with equally unusual food choices, such as sandwiches and cakes. Their new brand face was quickly recognized as a synonym for being young and different, which is why this franchise has crossed the borders of Kuwait to other countries of the Arabic peninsula. We wish them even more sweet success!